406 pages | 50 B/W Illus. The eighth edition of Walton, Smith, and Wallace's landmark text is better than ever. Cemented as the introductory leading text in Black Politics since its inception, this text explores the vast landscape of African Americans' experiences as part of the American political fabric. Brilliantly, the revised edition continues its tradition of excellence by providing readers with historical details for in depth exploration of the Black American political community. As African Americans grow increasingly diverse, the book aptly expands the text's inclusive framework that engages many intersectionalities of Black political activity, and includes a cogent and powerful analysis of the presidency of Barack Obama and its significance. This book is required reading for anyone interested in Black politics, Black American life, and the role of America's institutions in the journey toward freedom in the Black experience. American Politics and the African American Quest for Universal Freedom is the preeminent text from noted scholars in the field of Black politics. The authors provide an alternative understanding to the foundation of American politics, which is certain to broaden students' perspective about the true meaning of freedom in America. The new edition provides up-to-date, detailed information about the Obama presidency and the future of Black politics in America. This text essential to any course in American politics. American Politics and the African American Quest for Universal Freedom is the definitive textbook in the field of Black Politics. In this most recent edition, the authors offer an in-depth analysis of the presidency of Barack Obama, examine the influence of African Americans at the state and local levels, and provide a timely assessment of the 2016 congressional and presidential elections. American Politics and the African American Quest for Universal Freedom is a very comprehensive, informative book that details the major actors, events, and issues in African American Politics. It is a must-read for students, scholars, and laymen alike. 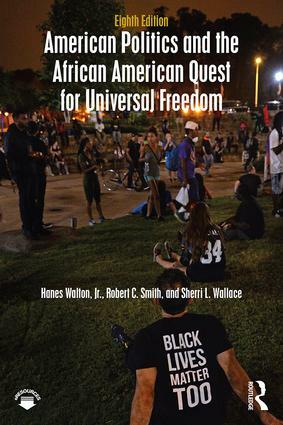 I began using American Politics and the African American Quest for Universal Freedom as the textbook for my African American Studies courses with the 6th edition, and I enthusiastically anticipate the release of this 8th edition. This text documents the significance of the Barack Obama presidency while continuing to define the historic importance of terms such as freedom, racism, inherently inferior, and the three-fifths clause, as it relates to African Americans in these United States. American Politics and the African American Quest for Universal Freedom offers the most thorough assessment of African American politics in the discipline of racial politics. It provides both historical and theoretical insight into African Americans’ relationship to foreign policy, the federal courts, Congress, the U.S. Presidency, federalism, elections, social movements, public opinion, and the Constitution. The book shows that African American political agency is constitutive of the American political tradition, and is a must-read for all political observers interested in understanding African American politics and American politics in general, including scholars, students, elected officials, and policy advocates. Hanes Walton, Jr. (1941-2013), Professor of Political Science, University of Michigan, was an architect of the modern study of African American politics. Over four decades of prodigious research (including 25 books) and conceptual refinement he helped to make the subfield of black politics an important area of study in political science. His last book was The African American Electorate: A Statistical Portrait. Robert C. Smith, Professor of Political Science Emeritus, San Francisco State University, is the author of multiple books and articles and of the Encyclopedia of African American Politics. His most recent books are Conservatism and Racism, and Why in America They are the Same, and John F. Kennedy, Barack Obama, and the Politics of Ethnic Incorporation and Avoidance. Sherri L. Wallace, Associate Professor of Political Science, University of Louisville, has received numerous awards for excellence in teaching and instructional design and serves in a variety of teaching and learning capacities with APSA task forces, curriculum assessments, and textbook evaluations.